2온스 아누비스(죽음의 신) 울트라 돋을새김 실버라운드 Purchase this 2 oz ultra high relief silver round featuring the Egyptian god Anubis from our online store at the best price. Fast and discreet shipping. Anubis is the god of the afterlife in ancient Egyptian religion, depicted as a man with the head of a jackal. Anubis protected graves, and was also thought to determine who would be allowed to enter the afterlife. 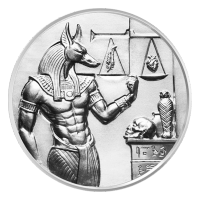 The obverse of the round depicts Anubis with a scale performing a "weighing of the heart" ceremony to see if someone recently deceased would be allowed to enter the afterlife. If the heart weighed more than a feather the person would be cast into a lake of fire! The reverse displays a pyramid in the background, with a jackal sitting atop a winged sun disk. Anubis is spelled out in hieroglyphics in the field. A beautiful and highly detailed way to protect your savings, order yours today!